A working air conditioner is one of the best things you could have on a hot Nashville day. So you don’t want your system to break down or struggle just when you need it the most. Maintenance can keep your air conditioning system working at its best so your home is always cool and comfortable. When it’s time for Nashville air conditioning maintenance at your home, call Halo Heating & Cooling. We are experts at Nashville HVAC and we make it our goal to give you a Heavenly home with air that feels comfortable and clean. Contact us for your maintenance needs at (615) 383-4822 or through our website contact form. Regular maintenance can help you keep your air conditioning system working as it should, which will keep your home properly cooled. It will also cut down on costs of repairs and on the money you spend to run the unit. Maintenance can prevent an air conditioning emergency because it prevents problems from dirt buildup and incorrect refrigerant levels, and gives us the chance to catch problems with parts at an early stage. This service can help keep your system running for its full lifespan, preventing you from needing to replace the unit too soon. We recommend that you have your maintenance service performed once a year at a minimum, although our club includes twice-a-year tune-ups. Your maintenance service will include an air conditioning maintenance technician coming to your home and cleaning the system, checking the refrigerant level, checking parts and providing other services. We can perform our maintenance services on any brand or type of air conditioning system. You can have maintenance performed any time of year, although it’s a great idea to have this service done before the summer. This way, you can ensure your air conditioner is working at its maximum capacity before you expect it to chug out cool air during the hottest season. At Halo Heating & Cooling, we work to make Nashville AC maintenance affordable for you. The cost will vary depending on the type of maintenance you need performed, so ask us for an estimate. Also, check with us about a maintenance discount to cut down your costs. We have the Halo Comfort Club, which provides special pricing on tune-ups and repairs. 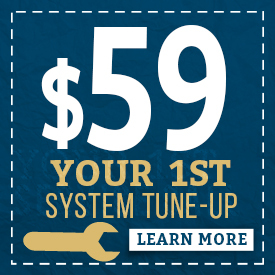 In the club, your first tune-up only costs $59! Make Us Your AC Maintenance Company! Halo Heating & Cooling sends qualified professionals to your home to perform maintenance services. We also provide a 100 percent satisfaction guarantee to our customers, along with a two-year warranty on workmanship. Our company provides full Nashville HVAC services for your home, so we can maintain, repair and install air conditioning systems. We perform the same services for heating systems and we also provide services to improve the air quality inside your home. Our specialty is providing a home that has the right temperature, humidity level and air quality — this combination is what we like to call a Heavenly home. Ready for Air Conditioning Maintenance in Nashville? Don’t wait to have your AC maintenance service at your Nashville home. Through regular maintenance, you can keep your system running smoothly all year so it’s ready whenever you need it most. For your next maintenance session, contact our AC maintenance specialists at Halo Heating & Cooling. You can reach us through our website form or by calling (615) 383-4822. Does your home feel Heavenly? If not, give us a call!